You can upload your Actual Sales if you do not have an integration with one of our supported POS partners. These Actual Sales numbers will be imported to the Dashboard and the Weekly Budget Tool, and will be used to calculate your Projected Sales. Not sure if your POS integrates with 7shifts? Click here to see a list of our active POS integrations. 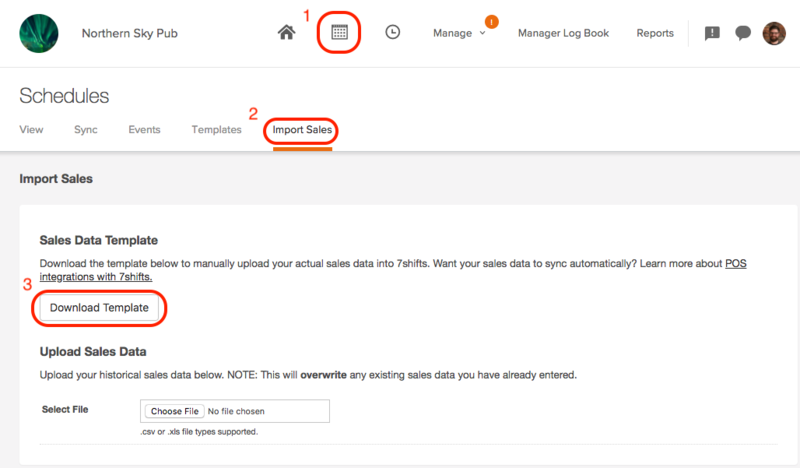 Admins and only managers with both the 'Can manage schedules' and 'Can manage sales projections' permissions will be able to upload sales data. Your Sales export should include "Net" sales, not "Gross" sales. Your export should include individual receipts (Best) or 15 minute to 1 hour increments (Okay). Click the 'Calendar icon' to access the schedules page. 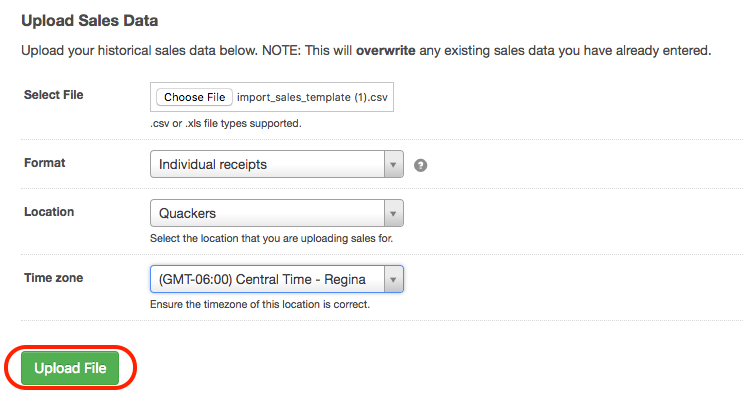 From there, select 'Import Sales' above the schedule. Select 'Download Template' beneath the Sales Data Template heading. You will want to fill this template with your actual sales data from your POS. You can copy your actual sales report into this file before uploading. Once you've filled out the template, you can then upload the file by clicking 'Choose file'. If there are errors, you will receive a warning describing those errors. You'll need to correct those and re-save before trying again. Format: 'Individual receipts' or 'Hourly sales'. For more accurate projections we recommend entering the individual receipts. Location: Choose the specific Location that these sales are for. Time zone: Ensure that this is correct for the Location entered above. After filling selecting the appropriate options, simply click on 'Upload File' to complete the upload. 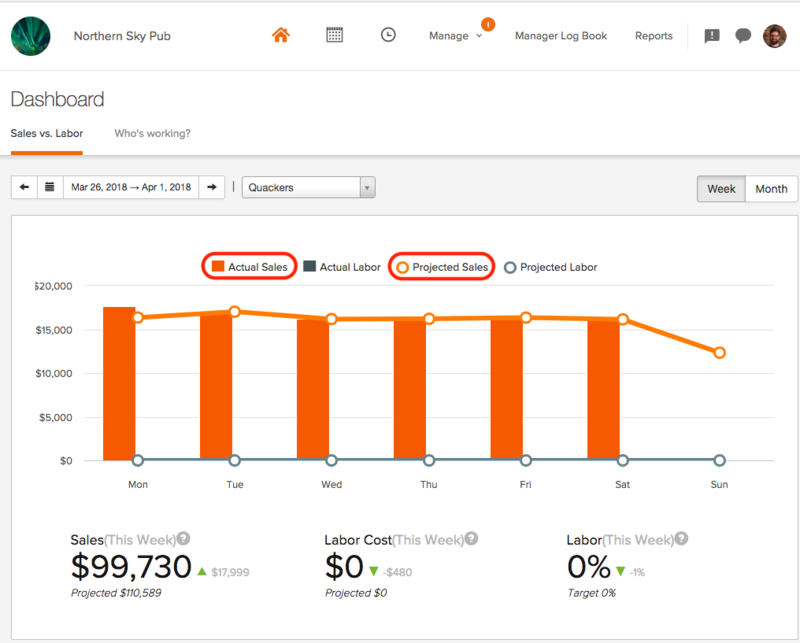 Once the upload is successful, your Actual Sales data will now appear on the Dashboard and Weekly Budget Tool on the schedule for all dates entered on the template. This data will then be used to create and fill the Sales Projections going forward.